Our vision at PennDOT is to create a better quality of life built on transportation excellence while exuding the values of safety, modernization, customer service, communication, and workforce development. The Governor's Awards for Excellence is a prestigious and competitive program that recognizes commonwealth employees for exemplary job performance or service that reflects initiative, leadership, innovation, and increased efficiency. Six PennDOT employees were part of a team of seven state employees honored for their role in relocating approximately 130,000 mussels from the construction area of the Hunter Station Bridge in Forest County. Many of the mussels were endangered or threatened species. The move prevented a 44-mile detour for over 1,100 vehicles each day and gave the species opportunities to re-establish populations in areas where they have not existed in over a century. "The employees being recognized have gone above and beyond their job requirements to provide outstanding service and make government more responsive and effective," said Governor Tom Wolf. "Their accomplishments are truly exemplary and inspiring. We are fortunate to have such outstanding public servants working for the people of Pennsylvania." Individual and group awards​ were presented to 30 other state employees during a ceremony May 22, 2017. 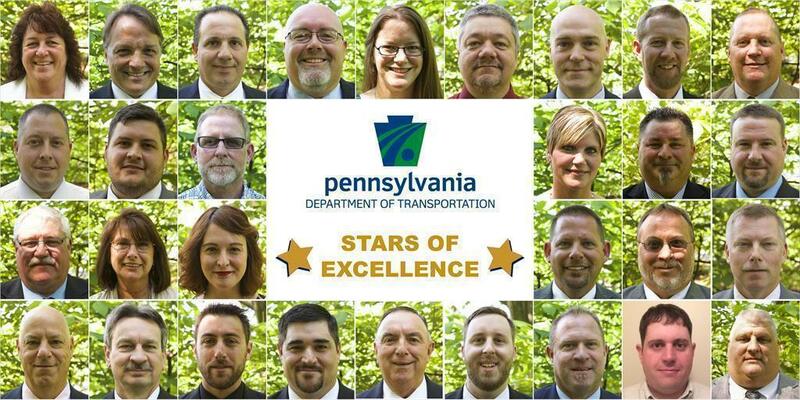 Within PennDOT each year, the secretary gives nominated employees a Star of Excellence Award — the agency's highest recognition — for their outstanding performance. "The Star of Excellence award illustrates that these employees take to heart our mission of providing the most effective and efficient transportation services for the roughly 12 million people of Pennsylvania," said PennDOT Secretary Leslie S. Richards. "They demonstrate a strong culture of service and caring that makes a big difference for the people of Pennsylvania." More of our accomplishments can be found in the 2016 Annual Report (PDF).